As tall trees in urban gardens become rarer, the loris appears to find electric wires an alternative way to move around. But many end up being electrocuted. 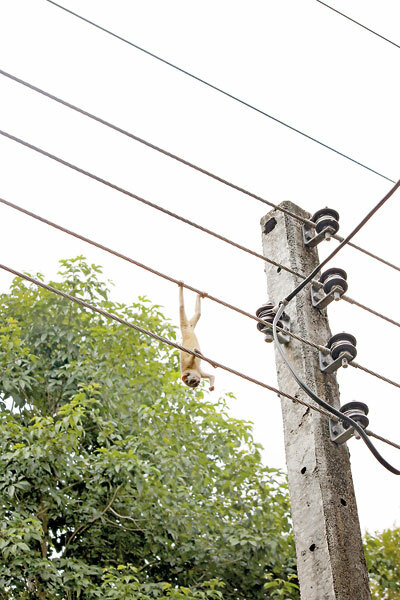 One lucky loris that got stuck on a power utility post last Monday was rescued in Anuradhapura town. Young Tharindi Pathirana who lives near the SOS Children’s Village in Anuradhapura town heard screams around 9:00 pm. It lasted about 20 minutes. With her father’s help she began looking around and they found the frightened creature. But, by the time they reached the location, it had fallen to the ground. They took it home and alerted the wildlife officers, but they could not come until the following day to take custody of the animal. Sri Lanka is home to two species of loris, namely, the gray slender loris and the red slender loris. These species have two subspecies, each restricted to various parts of Sri Lanka. The Sunday Times contacted Chaminda Jayasekara – the naturalist of Vil Uyana hotel who also published a book about the loris to help identify the species that was saved in Anuradhapura. He identified the animal as a grey slender loris, which belongs to a subspecies scientifically categorized as loris lydekkerianus nordicus. “I have come across at least five loris deaths due to electrocutions during the past six months. Last March, I saw a loris death at Kaduruwela in Polonnaruwa,” Mr Jayasekara says. He lists Polonnaruwa, Girithale, Anuradapura, Mihinthale as areas in which electrocutions occur often. A number of loris have been seen in urban settings where power lines are abundant and it seems these insect hunters use the utility posts and lamp posts as places to find prey. Mr Jayasekara also said he had witnessed a number of loris killed in collissons with vehicles on roads. 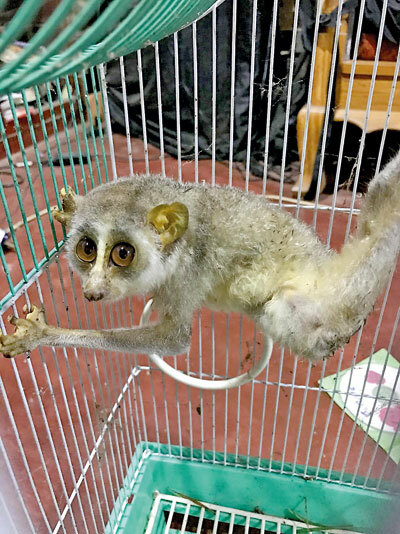 Loris researcher Saman Gamage says translocating these animals should be done with caution as there are a number of subspecies in various parts of the country. Translocating could result in species mixing. Mr Gamage points out that loris populations can survive in many isolated patches of forest, but the numbers are declining. This entry was posted on May 9, 2017 at 01:54 and is filed under Conservation, Loris. You can follow any responses to this entry through the RSS 2.0 feed. You can leave a response, or trackback from your own site.